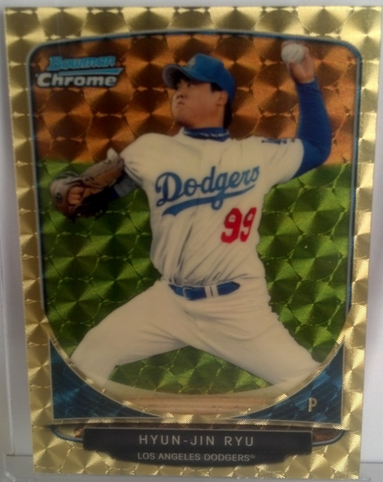 Following up on last weeks post featuring the Yasiel Puig Superfractor rookie card, I have just learned that the Hyun-Jin Ryu Superfractor card is also available for sale on eBay. Check it out above. The auction listing can be found here. It has a "Buy It Now" price of $1,500.00 with over 2 weeks remaining in the listing. Compared to the asking price for the Puig card this seems downright reasonable. On the other hand, this card isn't truly his first Topps card. He has cards in the Topps flagship Series 2 Baseball card set, as well as, Topps Archives and Topps Museum. Currently, there are 16 offers on it with 25 collectors watching the auction. I'm very surprised this has yet to to sell. 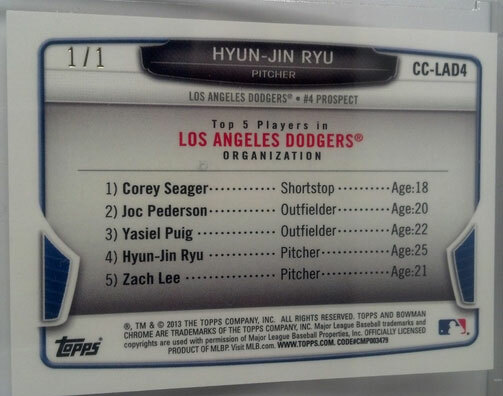 There are some monied Ryu collectors out there who, I'm sure, desperately want this "1 of 1" Ryu card. 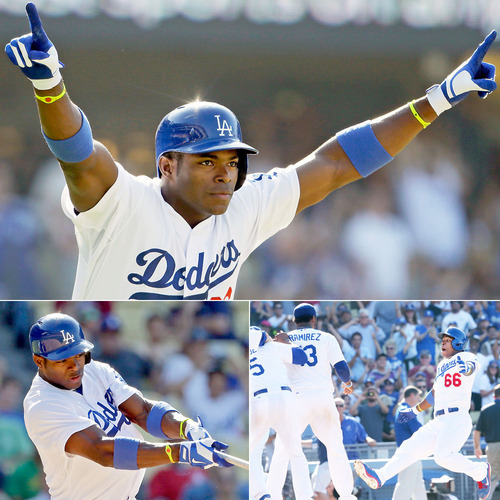 I have a brief Yasiel Puig Superfractor update. What went from an offer to buy my son a pack of cards, turned to the purchase of a full jumbo box based on his reminding/convincing me of his lucky picks for me in the past with retail blaster boxes from Target. Truth be told, this box was a bit out of my price range, but it was an opportunity to share something that I love with my Amazing Son! I was hoping for a Puig but never imagined pulling the superfractor. I am planning on having the card graded and slabbed for its protection. I'd like to see this card surpass the Strasburg superfractor but am not driven by greed, but base it's value on his limited cards available, his 5 tools, his being in the company of DiMaggio, his playing for the Dodgers in a Huge Market in Los Angeles, and the excitement and joy that he brings to the game day in and day out. No lottery numbers and the money most likely will go to help pay for college, I'm sure. The auction has since closed, and it appears the owner will have it graded in anticipation of a future sale. As for what it's worth, I really don't have a clue. BTW, in case you're wondering what the lottery number mention above is all about... Well, I asked him if he purchased some lottery tickets that afternoon, and whether he could pass the numbers along to me. I figured it was worth a shot. In April Topps released their Gypsy Queen set, but it didn't include a Yasiel Puig card. This isn't surprising since he had yet to play a Major League game and only current players are allowed in their MLB card sets. Well, over the weekend, Topps decided to fix that. 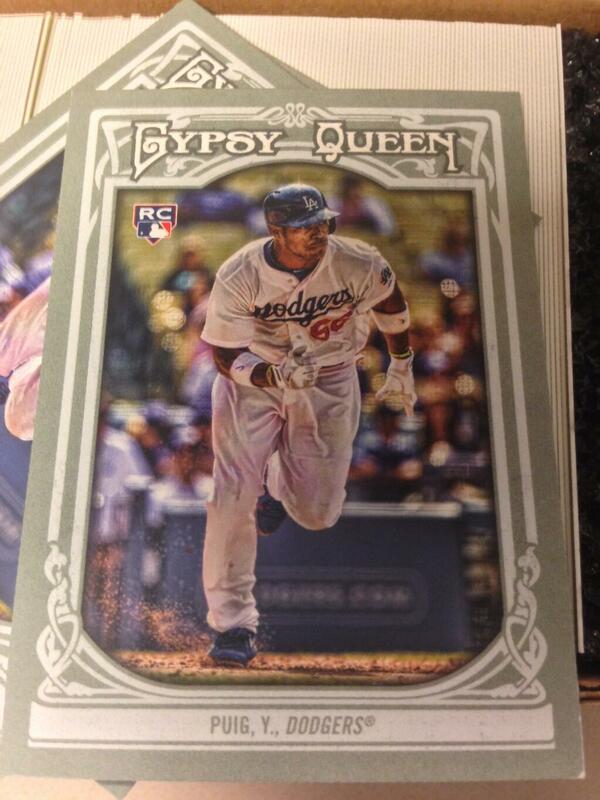 They announced on twitter a new limited edition Puig Gypsy Queen card that can only be had at the upcoming National Sports Collectors Convention in Chicago. All you have to do is go to the Topps booth with a box of their 2013 WBC Tribute cards, and open them up in their presence. In return, you get the above Puig card. This figures on being one of his scarcest cards of the year. Only 100 cards per day of the show will be given out. Since the show runs from Wednesday to Sunday this week only 500 cards have been made. 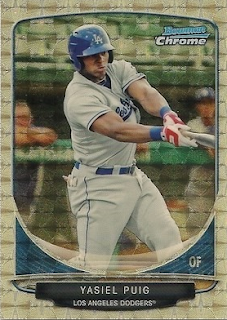 Puig Cards are limited to 1 per person per day AND we will only have 100 per day to distribute! Looking forward to the National! Wow! I would love to be there. I love this group of pics featuring Puig's home run. Photo via Dodgers tumblr. Check out even more pics from yesterday afternoon from Jon SooHoo here. "Ryu earns praise of fellow South Korean Park," via Austin Laymance and Mark Sheldon at MLB.com. "He's adjusted very well and is pitching very well," Park told MLB.com from Cooperstown, N.Y. "I think he enjoys it very much. I'm very proud and enjoy watching him." Naver.com has a whole bunch of pics focused on the matchup between Ryu and Choo. "Choo-Ryu matchup a big draw for S. Korean population, via Mark Sheldon at MLB.com. "I like to see a lot of Korean fans because I've played in Cleveland and Cincinnati, where there aren't a lot of Korean people," Choo said. "It's quiet -- no media, no fans. But here, it's like a small Korea." Evan Bladh at Opinion of Kingman's Performance makes note of a new fashion trend currently hitting the Dodgers. Dodger Penguin shares a couple of autographed baseballs he recently got at Dodger Stadium. 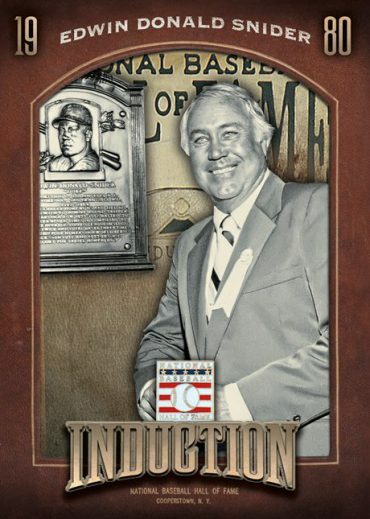 Chris Olds at Beckett.com provides a preview of the upcoming 2013 Panini Cooperstown set; including a sneak peek at a Duke Snider card. See the Snider on the right. "Isotopes Notebook: Gordon slows it down to improve," via Christopher Jackson at Examiner.com. "Dodgers juggle lineup another day with Carl Crawford still ill," via Lance Pugmire at the LA Times. "Puig's base running becoming an issue," via Mark Saxon at ESPN. "We're trying to corral it a little bit, but without putting too many restrictions on him," Dodgers manager Don Mattingly said. "As you get into big games, any game can be the game it costs you, so we just want him to understand situations." Tom Bartsch at Sports Collectors Digest writes about the Helmar Brewing Company cards. 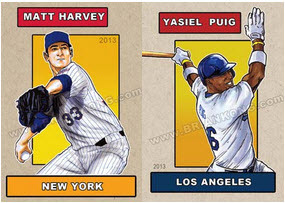 Noted sports artist Brian Kong will be at the National Convention and will have a Yasiel Puig card available for sale only at the show, via Sports Collectors Daily. See it below. He will be in booth #787.